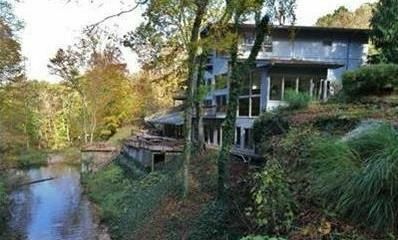 Very unique, Frank Lloyd Wright type home built into a rock hill side with many of natures beauties to enjoy. Enjoy a catch for dinner by casting from one of the 5 decks totaling 1500 sq. ft and overlooking a stocked pond & waterfalls that you can easily catch a 15'' striped bass. Plenty of woods and natural canyons surrounding the property. This home sits back a 1/3 mile long paved and is being offered w FREE GAS from existing wells. In 2010: high efficient gas/AC unit installed, the roof was replaced and house painted. Brand new updates in 2013: Driveway redone, repairs throughout the home with drainage, downspouts, skylight updates, new deck lighting, professionally refinished and re-stained decks and much more!